I hate Pepsi Max. I love the taste and often drink the odd drop throughout the week, but I hate it, because it means I have to work extra hard at the gym. And when I'm on the rower machine I hate it most. In comics, there are characters I hate but love too (what can I say, I'm a complex guy) and this edition of Now Comes The Cosplayer is dedicated to them. Behold! Crystal earnt my fanboy wraith, 'replacing' the Invisible Woman on The Fantastic Four. Sure she was there for this reason and that, but get this straight Marvel - no one replaces Sue, not even Wonder Woman (though that would be cool for an issue or two). Here cosplayed by Spain's Florencia Sofen Muir, and photographed by Peck Photography Crystal looks just as hatefully awesome as ever, if not more. Hank Pym and his role in the Marvel movieverse was a hot topic in the comments section last week. While as a fan, I loved the thought of his Giant Man identity stomping between skyscrapers, I hated him for what he did to The Wasp during his Yellowjacket days. Part of an awesome Avengers cosplay group - which you can see in full on the IADW Facebook page here, even this tightly cropped, this Cosplayer has really become the founding Avenger. V from V for Vendetta is probably comics most loveable / hateable dude. I mean how many people cook their sidekick a nice brekky, then lock them up, shave them and interrogate them? Photographed by MV Partsch, I tell ya, there better be some waffles thrown in with that egg. Okay so '+ Plant' really should have been in the heading, as it almost steals the show, but hey, who doesn't love Gotham's deadliest greenie? 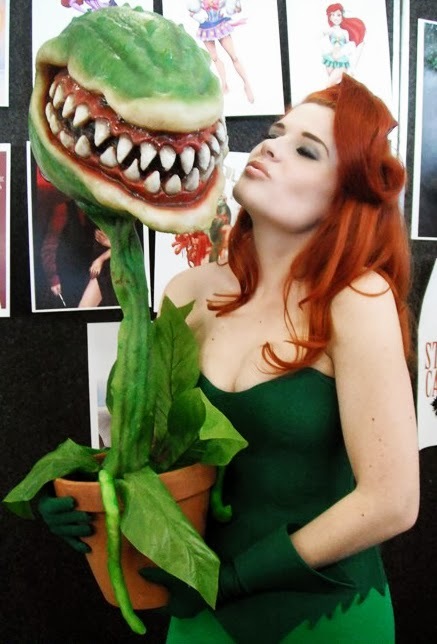 This cosplayer captures just enough Bettie Page in her own outfit to perfectly plant herself in the shadow of her icon, but by actually bringing a touch of Little Shop of Horrors with her, she wickedly shows there's only one love in Poison Ivy's life - sorry guys. Hahaha! Poison Ivy with Audrey II. -That's classic. So, why are you not crazy about Ivy as a character? I was never a fan of Yellowjacket or Crystal either... But that thing on her hair always intrigued me! Is her hair dyed with that shape on it? Is it some kind of Inhuman-scrunchy??? The world may never know. As for V- you're talking about the anarchists idol Guy Fawkes right there... And I remember every 5th of November and get a penny for my guy before he is burnt in effigy! BONFIRE NIGHT!!! Don't get me wrong King - I love Ivy as a character, in fact down from old Riddles, I think she might be tops. Just the love hate comes in that it's gotta be wrong to dig someone that deranged. 'Dig' look I'm leakin' puns without even trying. Crystal never seemed to have a backbone to me, until she dated Quicksilver in the Avengers. Then nothing until she recently got in an arranged marriage with Ronan. That actually was my light-bulb moment with the character where I went ohh - okay - I get you now. As for the scrunchy (lol) I hate it because it's hard to look like the hair is connected sometimes when you draw her. You never get that problem with Gwen Stacey (swoon). I quite like Pepsi Max but this morning officially gave it up. No I still love it but my local store has hiked up its price from £1 to £1.69. Yikes!!! Thanks for the " kind" words about Crystal. She's unfairly maligned on our FF forum fir being a marriage wrecker but that was mostly down to Engleharts writing...he just cant seem to write women as nice people. Her cosplay here is good except for the trashy high heeled boots. Yellow jacket I like! The guy has perfectly captured his arrogant devil- may- care facial expressions. Ive just re read Avengers Forever over the weekend and this cosplay wouldve fitted right in. Hope you saw Jellowjacket's full costume by clicking the link to the Facebook page Karl, the costume is bang on, and the Avengers group he is a part of, even includes Quicksilver, Vision and Scarlet Witch - so they really are a comprehensive bunch! Jeez - that's a lot for a bottle of Pepsi Max - in New Zealand you can get 2 litres for $2. Mind you in election year one idea being floated is a fizzy drink tax, so that might change. Floated / fizzy drinks. Geez my puns are in overdrive today! Thanks for the comments! Fantastic, simply fantastic. Love the Poison Ivy/Little Shop of Horrors combo. Plus someone cos-played as V cooking breakfast? Bizarre fan love right there. damn good job all around though.